Experience the natural majesty of Oregon on our guided two week hiking tour. Discover the beautiful State of Oregon on foot, hiking along the majestic Columbia River State Trail. The Multnomah Falls are just one of the major waterfalls you will get to see on many relaxed walks and nature hikes. The first few days we will explore Northern and Central Oregon with its diverse climate zones. From lush green forests where wild Rhododendrons grow we reach the high Wallowa Mountains, also called Oregon’s little Switzerland. A hike through the Eagle Cap Wilderness is one of the fantastic adventures you will always remember. Just within a few hours drive the landscape changes dramatically, where the high desert with its most spectacular colored hills, the Painted Hills, will appear. John Day Fossil Beds National Monument is a unique fossil site with an incredibly long period of fossil deposits, some on display at the visitor center. You will encounter a lot of Pioneer history in the first few days of this Oregon hiking tour. Among highlights will be the historic Pendleton woolen mills, a visit to the Mary Hill Museum and a stop at the National Historic Oregon Trail Interpretive Center. A ride on an original steam train to Sumpter ends in a small “gold country” town that features an original, huge gold dredge. For more details and information visit Oregon Nature Trails. 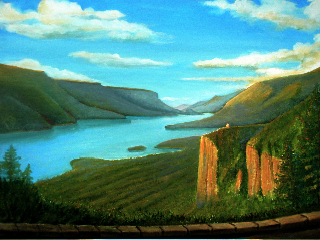 Columbia River Gorge – painting by Pablo Jacques, Southwestern artist and former guest on the Oregon Trail Dreams tour. Top Attractions on our Oregon Hiking Tours - private guided group tours can go from Portland, Oregon to San Francisco, California and reverse! The tour leader and driver will meet the group at the hotel lobby in Portland at 4:30pm. We then drive to the famous Portland International Test Rose Garden for a visit. Later we will eat dinner on the banks of the Willamette River. The tour guides will share some important information on the upcoming tour and hand out travel documentation. Our journey begins in earnest along the scenic historic Columbia River Highway where we will stop for our first hike, the Columbia River State Trail featuring magnificent views of the mighty Columbia River. Later we will take a walk at Multnomah Falls for some photo shots. Hike and picnic at Trillium Lake near majestic Mount Hood. We’ll visit the Mary Hill Museum in Washington State before reaching Umatilla for a night on the banks of the Columbia. Stop in Pendleton for a guided tour through a historic wool mill. Then, visit a native American center on the way to Joseph, a small town with wonderful art galleries. Evening hike at the scenic Wallowa Lake. Night in Enterprise. Our hike will lead through the Eagle Cap Wilderness along the Chief Joseph Trail. The area boasts beautiful wild flowers, mountain creeks and views over Wallowa Lake and the Wallowa Mountains. Alternatively, you can visit “little Switzerland” on top of the 7500 ft. high Mount Howard, reached by aerial tramway. Enjoy the views and mountain flora. Next, we stop at the impressive National Historic Oregon Trail Interpretive Center before taking a walking tour to see the historic wagon ruts of the Oregon trail, preserved for over 150 years. In McEwen we board a historic steam train (if running) and travel to Sumpter, a tiny gold town featuring a monstrous gold dredge. Evening in the tiny gold mining town of Sumpter. Bend In John Day we stop for a tour through the Kam Wah Chung Museum of Chinese pioneer history. The highlight today is the John Day Fossil Beds National Monument where we will take several shorter hikes to see fossils and the famous Painted Hills of Oregon. Here we are surrounded by a surreal landscape of colored hills. We travel on to Bend, the largest settlement of Central Oregon, for a two night’s stay at a lodge with hiking trails to beautiful Deschutes river right outside your motel doors. Bend Today, we hike through the fantastic Newberry National Monument, home of the region’s largest volcano. Trails follow an interpretive site leading to a very rare volcanic Obsidian flow. Hike around beautiful, sparkling Paulina Lake. After the picnic we visit the famous High Desert Museum in Bend featuring a great display of natural and cultural history of the Pacific Northwest. The evening we will spend in Bend with its galleries and good restaurants. Our journey leads westwards over the volcanic Cascade Range with snow covered mountain peaks as high as 10000 feet. We hike along a picturesque mountain lake fed by the springs of McKenzie River, over lava flows and along beautiful waterfalls. In the evening we arrive at the Pacific Coast and stay for 2 nights at a seaside resort with great sunset viewing.